Midwest Craft Con is a three-day creative Business Conference for Makers, mid-career crafters, makers and creative business owners taking place this weekend in Columbus, Ohio. The event will feature inspirational keynote addresses, thought-provoking panel discussions, hands-on workshops and business-focused breakout sessions from experts from Ohio, the Midwest and beyond. They have a die cut sticker that's a white circle with a smaller black circle featuring their Twitter handle. A fun take on a simple sticker in black-and-white that's classic and memorable. There's some fun and games, too: There are evening mixers, a trade show to explore and ample time network with fellow makers. Last year’s after-hours activities included karaoke, craft-offs and LOTS of googly eyes. This is for anybody who runs a creative business. Whether you’re a veteran indie crafter, an upstart maker, an artist, a designer or photographer: You’ll leave with new ideas, techniques and friends. The first event in this series was the Midwest Craft Caucus, which took place in Columbus, Ohio, in 2011. 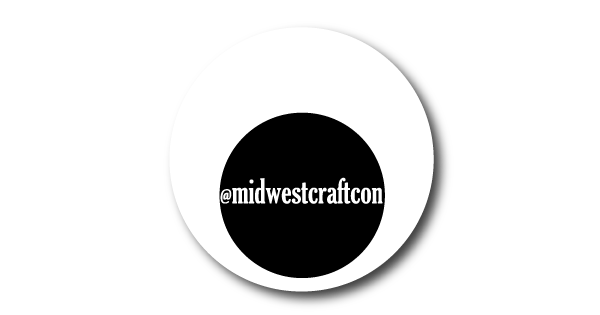 Now Midwest Craft Con is brought to you by Brit Charek of Akron, Ohio, who organizes Crafty Mart; Grace Dobush of Cincinnati, Ohio, who co-organizes Crafty Supermarket; Megan Green of Columbus, Ohio, who organizes Craftin’ Outlaws. The Midwest Craft Con’s purpose is to provide creative, engaging, and educational opportunities for artists and entrepreneurs to help their businesses thrive. The Midwest Craft Con has the specific purpose of conducting a conference which (a) showcases regional commitment to the arts; (b) fosters discussion and education about the arts; (c) educates creative entrepreneurs on best practices to foster civic engagement; and (d) provides entrepreneurs the opportunity to collaborate with others to advance the state of the arts regionally.